Will in-flight internet ever be quick enough to stream? Air travel has, for many years, been a largely phone-free zone. We've had to turn off our electronic devices, and rely instead on movies and in-flight magazines for entertainment. Today, connectivity is much more important. Passengers don't just want to admire the view, or complain about a meal to their neighbor - they expect to be able to tweet about it, immediately, complete with pictures. Many airlines are responding. In-flight Wi-Fi is now accessible on around 40% of US flights and on international long haul flights via companies such as Lufthansa, Emirates and Qatar Airways. Norwegian and Turkish airlines even offer the service for free, while Scandinavian airline SAS is testing it on some of its air craft now. There are significant problems, though. Connections are often slow and unreliable. Prices can be high, perhaps £15/$20 or more - usually per device - for a full flight. And unsurprisingly users, for the most part, aren't happy. "Only 28 per cent of business travellers are satisfied with in-flight Wi-Fi offered by airlines", said a 2012 FlightView survey of over 600 US passengers flying for work. What's more, this situation is probably going to get worse before it gets better. Why? Let's get back to basics. 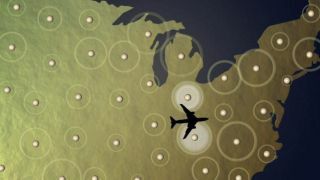 The key problem with airplane Wi-Fi is how you connect with the ground, and there are two main routes that companies might take. US provider GoGo has built a network of 3G ground stations all across the US, and planes communicate with these as they fly overhead. It's a simple system, but bandwidth can be limited to as little as 3.1Mbps (and that's for the entire flight, not per customer), so you can forget any ideas you had about streaming videos. This is just the start, of course. The company is now rolling out its ATG-4 technology, equipping planes with dual modems and directional antennae, and this all helps boost total bandwidth to a theoretical maximum of 9.8Mbps - but that's still not very much. And it won't help at all when a plane flies out to sea and leaves the ground stations behind. The alternative approach is for each plane to connect via satellite. Some use legacy L-band technology, now slow and relatively expensive. And that's why higher-frequency Ku-band (12-18GHz) satellites are the mainstream, relatively economical and delivering good performance. Lufthansa's FlyNet system, for instance, claims download speeds to the aircraft of up to 50Mbps, which isn't bad at all for the middle of the ocean. From your point of view as a passenger, all you then have to do is connect to the system on the plane. Telecoms company OnAir takes a particularly convenient approach, the company told us: "OnAir offers the choice of GSM and Wi-Fi. 80% of passengers use Mobile OnAir, the GSM mobile phone network. You just turn on your phone, use it, and just like international roaming, the costs are included in your regular phone bill." Connect via Wi-Fi instead and you'll have to pay according to your airline's own rules, which vary considerably: you might be able to pay by bandwidth, for time used (anything from a few minutes to a monthly unlimited pass), distance travelled and more. Choosing an individual option isn't difficult, but this does make it hard to compare the services on offer. If you're interested in airline Wi-Fi, be sure to read the small print extremely carefully. Where next for in-flight Wi-Fi? When you look at how much we're currently paying for frequently sub-standard plane connectivity, it's easy to assume the providers are just profiteering, cashing in on those who really need to be online all the time. But the reality isn't nearly as straightforward as that.